September is an wonderful time of year, where there is an abundance of blooms from many so annuals and perennials in private and public gardens. Not only is such a floral display pleasing to the eye, but it is essential for so many insects and birds, as they prepare for winter in Northeast Texas, or fuel up for their long trip south on their migration to warmer climes. An essential plant for the hummingbird southern migration is Turk’s Cap (Malvaviscus drummondii). This native perennial is very versatile in the garden, growing and blooming equally well in light shade or full sun. It is in the mallow family, along with hibiscus, and if you look at its flowers, you will see the long pistil with its yellow stamens attached, characteristic of mallows, sticking out of the twirled petals. 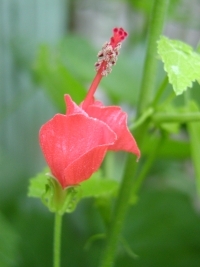 Turk’s Cap petals do not open flat like hibiscus, rose of Sharon and other mallow members. Rather they remain somewhat closed and twirled, and with the pistil sticking out of the closed petals are reminiscent of a Turk’s turban, hence the common name. Its heaviest blooming season is mid-summer through fall, and provides important feeding stations for ruby-throated hummingbirds as they fly south for the winter. 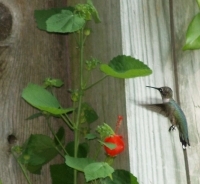 Their bright red tubular flowers attract the eyes of both the hummers, butterflies and gardeners. Turk’s cap is common along the Texas coast, in areas like Rockport where they hold the annual "HummerBird Celebration", and in the Rio Grande valley near Brownsville. Here in northeast Texas, this drought tolerant, semi-woody perennial grows about 4 to 5 feet tall, with shoots often stretching and bending down in shadier locations. Therefore give it room to reach its full potential. While it can take prolonged drought, it will look and flower better with timely watering. It is best cut back to the ground in the winter. There are a few newer varieties, including a couple introduced by Greg Grant, who currently is Research Associate, Pineywoods Native Plant Center in Nacogdoches. ‘Pam Puryear’ flowers are peachy pink which do not fade in the sun. They look great against the apple-green foliage. 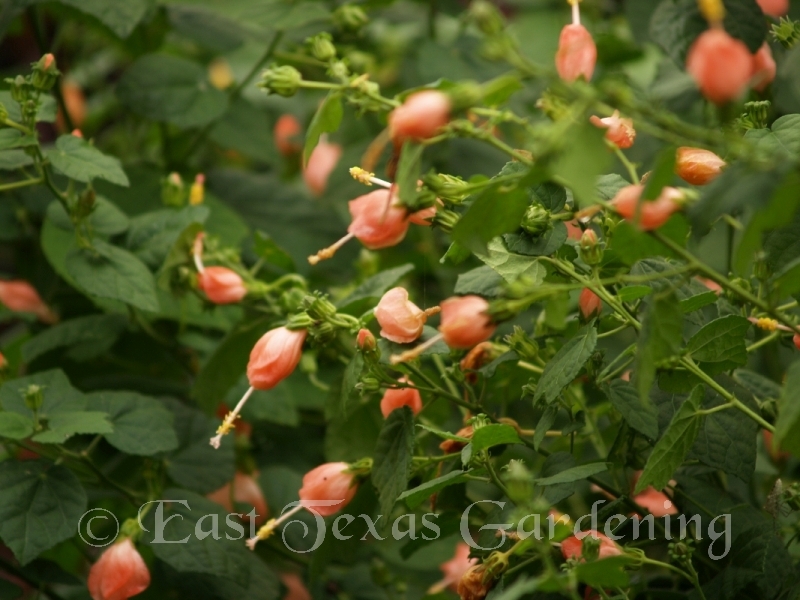 Another Grant introduction is ‘Big Momma’, a cross between the native and a tropical Turk’s Cap, whose flowers are 1/3 larger than the typical Turk’s Cap and which grows 5 to 6 feet tall and wide. 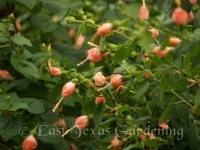 Because of their beauty, utility, toughness and heritage, Turk’s Cap was named a Texas Superstar in 2011. Texas Superstar is a designation given by horticulturists with Texas A&M to plants with superior quality for gardeners in Texas.